An immaculately presented 4 bedroom semi-detached family home in very good decorative order throughout with subtlety in the colour schemes. There is garage and off-road parking for 4 cars. A loft extension provides a superb master suite with bathroom together with 3 further bedrooms Delightfully secluded south facing garden and vendor suited. Approaching the property, there is a brick-paved frontage, an area of grass to one side and a long driveway. This provides off-road parking for 4 cars in addition to the single garage. There is a glazed porch to the front entrance and, entering the house, there is laminate flooring in the spacious hall with stairs ahead, living room to the left and kitchen ahead and beyond. The living room has a large window to the front of the house and there is a high quality deep pile grey carpet and walls in a grey/salmon colour scheme. There is a gas point available for a fire, if required but this is not currently in use. There is an archway through to the dining room with the same colour scheme and, this time, with laminate flooring which continues into the kitchen. There are large double doors from the dining room opening onto an extremely attractive area for relaxing or socialising with a covered pergola and decking. An ideal spot from which to enjoy the secluded south facing garden. The kitchen has a good range of wall and base units with under the counter lighting. There is a breakfast bar with space for 3 bar stools and recessed spotlights in the ceiling. The colour scheme is neutral with darker work surfaces and a feature inset pattern within the high quality stone splashback tiling. Integrated appliances include a Neff 4 ring gas hob and a Zanussi self-cleaning electric oven. There is space and plumbing for a washing machine, a tumble drier and an American style fridge/freezer. There is also a useful larder cupboard providing additional storage. The sink is below a large window overlooking the rear garden and there is a side door opening onto the driveway. Returning to the hall, this is generously proportioned and, given the layout of the drainage, there would be the potential to create a cloakroom, if required. Moving upstairs, the balustrade and stair rail are both wooden creating a stylish feature in addition to the white panelled interior doors seen throughout the house. 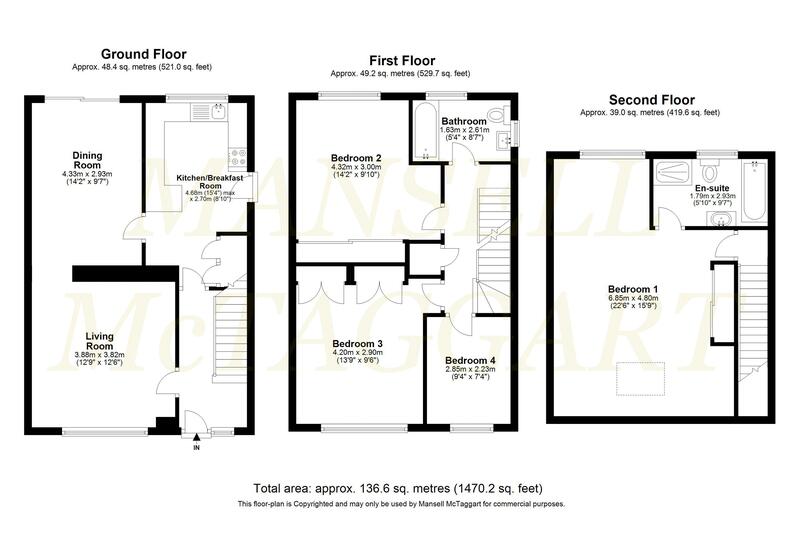 On the first floor there are 3 bedrooms with further accommodation in the master suite on the top floor. Bedrooms 2 and 3 are both generously proportioned double bedrooms and are similar in size. The bedroom to the rear of the house has two double wardrobes with mirror fronted sliding doors. The bedroom at the front also has two built-in double wardrobes. The single bedroom is adjacent to this, facing the front of the house, and is also a good size. The airing cupboard is located on the landing and provides really useful storage with both a hanging rail and shelving. The family bathroom has been refurbished to a high standard. There are full height limestone wall tiles in a neutral colour scheme and incorporating evidence of fossils within together with a feature inset panel alongside the bath /window sill with a mosaic in a sand/teal colour scheme. There is a bath with a contemporary shower above with a large square rose. There are stainless steel fittings with a white, rectangular wash hand basin with vanity unit below and Grohe taps and a white WC. The flooring is dark slate coloured vinyl, there are recessed ceiling spotlights, a chrome towel rail and frosted windows to side and also to the rear of the house. Moving up to the top floor, the loft conversion provides superb accommodation and has a Velux window to the front and a triple window to the rear. It is a particularly spacious bedroom with a large double wardrobe with mirror fronted doors together with additional eaves storage. There is an area to the side currently with a work surface with a mirror above and space for a fridge beneath The en-suite bathroom is large room with both a white bath and a separate shower cubicle together with a wash hand basin and WC. The wash hand basin has a stylish concrete base with inset glass and a contemporary, circular ceramic bowl. There are full height wall tiles in a mosaic style in teal creating a sophisticated look. There is a chrome towel rail, recessed spotlights and a large frosted window. There is a brick paved frontage with an area of grass as well as a long driveway providing off-road parking for 4 cars. The garage has power and light together with a side window overlooking the rear garden. The south facing rear garden is a real gem and is delightfully secluded. It has been restructured and it is now well-stocked with specimens from all over the world (further information available from the vendor) as well as a lawn. There is a large area of decking with a covered pergola above incorporating an established vine which produces sweet grapes. This is an ideal area for relaxing and entertaining with plenty of space for a table and seating. The garden is enclosed with a mix of brickwork and fencing so it is safe for children and pet friendly with a side gate opening onto the drive.